Relocation | Eat. Love. Namaste. Finding Support: When Jake relocated for Residency, he moved closer to where my family and friends were. However, I did not have any friends in my situation who had a partner that was going through Residency, nor did I have family that experienced this before, so I didn’t have anyone to ask for advice and support during the tough times that Jake and I faced. Also, most of our friends and family could not relate to some of the things, so the emotional support (or lack thereof) was tough for me. Later on, as we made more friends that could relate it surely helped with being alone most days, but it still bothers me that my person isn’t around a lot. If you are moving away from family and friends to a new place, one thing I highly recommend is making friends with other Resident’s partners. They will be the best support when you are frustrated or need to chat about your lifestyle. They get it. Making New Friends: Some programs offer a House Staff Spouse Association (HSSA) to meet other girlfriends, fiancés, and wives. Jake found about this during his Orientation, so ask your partner to pay attention to these kinds of groups for you. I also made new girlfriends by going to Resident events with Jake or hanging out with his colleagues. Some other ways to make friends is at church, joining book clubs, or volunteering. If you are not in medicine, and you are surrounded by physicians, you will be the quiet/observant one. Location: Before you move, you and your partner need to visit your new city to get an idea of which areas best to suit your family needs. Jake and I visited once together to check out all the amenities in town and drove down some of the streets to get a feel for the area. We even looked on Zillow for places to rent/buy. Some Residency Programs have lists of housing options available that are recommended by Residents and Fellows; such as reputable land-lords that offer houses/apartments/townhomes for rent, or houses that may be available to buy from graduating House Staff. Check ahead of time if your partner’s program offers these services since availability is limited and goes quick! If your partner “matched” with an Academic Institution in a large city like NY or Philly there may be subsidized housing options available. 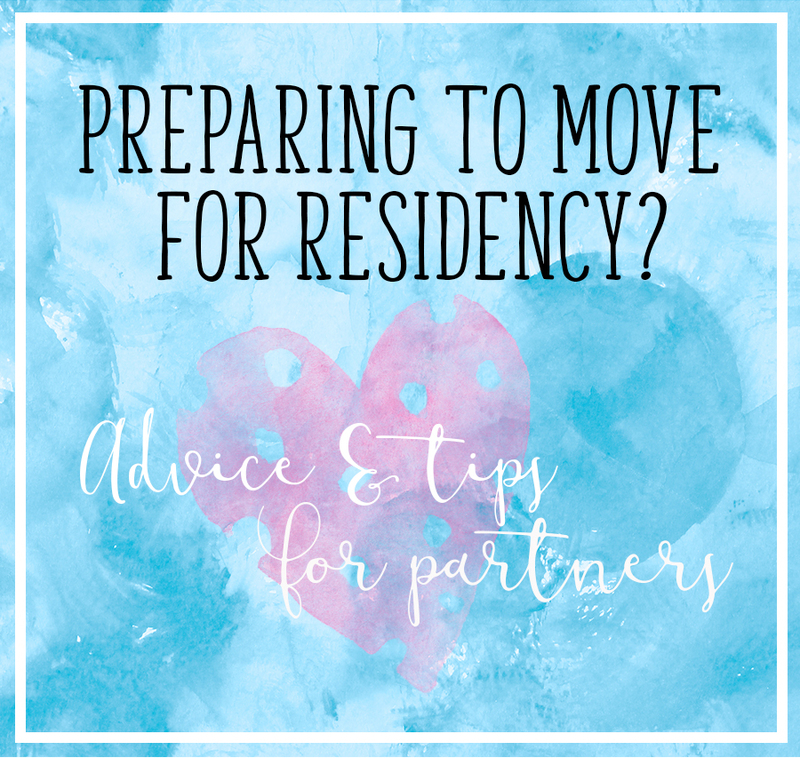 Buy or Rent: When Jake started his Residency we were nowhere close to buying; however, if your partner is committing to a 3+ Residency Program, then we recommend buying. Buying a house is a huge commitment, but renting for 4 or 5 years is a huge expense. Over the last 7 years, we spent $70,000 in rent alone. For us, it wasn’t the right time to buy a house since our relationship was still new and we weren’t engaged at the time. Saving money is not a good reason to get married or buy a house together with someone you’re dating. On the other hand, $70,000 is a lot of equity to have in a house. If you sell your house and get what you paid for it, you could say you lived in the house for free over that period of time. If you are planning on buying and you are unfamiliar with the area, rent first, then buy. Looking at school districts, amenities, location (safe or not), and distance from the hospital are key. If you are planning on renting, looking at school districts, amenities, location, and distance are important, but you also need to check if pets are allowed. When we started looking for places to rent, we could not find many options because most places did not allow pets, or did not allow a dog, or a cat. Pets: We have two dogs, and since travel for work, boarding was not the best option for us (plus, it would have been costly). We got close to our neighbors who helped us out, and when they couldn’t, we found a dog walker on Rover. Some of our other friends asked other Resident’s partners to help out with pets too, so don’t be afraid to ask. Selling a house at the end of Residency can add some uncertainty too, especially if you need to get a specific amount of money from the sale to cover your closing costs, agent fees, inspection fees, and fixer up costs. Not many Residents make the kind of money to be able to pay for two mortgages (in the event of moving to another city after graduating), so it could force you to take a lower offer than what you were hoping for. Housing markets go-up and go-down so don’t be fooled into buying a bigger house by your real estate agent if you’re approved for a huge Physician Loan. Physician loans are special loans for individuals who have graduated from Medical School. Remember: Only buy what you need. If you’re still on the fence about whether to buy; note that it takes 3 years to break even on a home. Therefore, it’s important to plan and estimate your mortgage to get an idea of how much you need to save and spend. Plus, take into account your total loan amount, throw in a few renovations before you move in or out. Do you have any questions that you do not see discussed in the topics here?